The King's Answer to Mr. Speaker's Speech. MR. George Howard being elected to serve in this Parliament, for the Borough of Tavestock in the County of Devon, and also for the Borough of Beare Alston, in the said County, elects to serve for the Borough of Tavestock, and waveth his Election for Bere Alston. Ordered, That Mr. Speaker do grant a Warrant to the Clerk of the Crown in Chancery, to prepare a new Writ to be issued forth for Election of a Burgess to serve in this present Parliament, for the Borough of Bere Alston in the County of Devon; and that the * * do pass the said Writ, under the Great Seal of England. Resolved, That a Bill be prepared for keeping of a perpetual Anniversary, for a Day of Thanksgiving to God, for the great Blessing and Mercy he hath been graciously pleased to vouchsafe to the People of these Kingdoms, after their manifold and grievous Sufferings, in the Restoration of his Majesty, with Safety, to his People and Kingdoms: And that the Nine-and-twentieth Day of May, in every Year, being the Birth Day of his Sacred Majesty, and the Day of his Majesty's Return to his Parliament, be yearly set apart for that Purpose. Ordered, That Mr. Pryn, Mr. John Stephens, Serj. Maynard, Mr. Finch, Mr. Skipwith, Mr. Charleton, Mr. Turner, and Serj. Glyn, be the Committee to prepare the said Bill. Resolved, That the Lords be desired to join with this House, in beseeching the King's Majesty, to appoint a Day to be set apart for publick Thanksgiving to God, throughout this Realm, for the great Blessing and Mercy God hath vouchsafed to the People of these Kingdoms, after their manifold and grievous Sufferings, in the happy Restoration of his Majesty to his People and Kingdoms. Ordered, That Sir Wm. Lewis, Mr. Finch, Mr. Perrepont, Serjeant Maynard, Sir Wm. Morris, Mr. Pryn, Mr. Turner, do withdraw, and pen a Petition to his Majesty to this Effect, upon the present Debate. Resolved, That this House be resolved into a Grand Committee, to consider of Ways for raising of Money; and that Mr. Speaker do presently leave the Chair. Mr. Serj. Glyn took the Chair. Mr. Serj. Glyn reports from the Grand Committee, touching raising of Money, that the said Grand Committee have made some Progress therein; and made a Sub Committee; and that the Opinion of the said Grand Committee was, that no Person have Vote in that Sub Committee, that hath received publick Money, and is liable to account. Resolved, That this House doth agree with the Grand Committee, That no Person have a Vote in the said Sub Committee of the Grand Committee, that hath received any publick Money, and that is liable to account. "I shall not trouble you with many Words; for really I am so weary, that I am scarce able to speak: But I desire, you may know thus much, that whatsoever may concern the Good of this People, the Defence and Confirmation of your Laws, and the Establishment of Religion, I shall be as ready to grant, as you shall be to ask: And I shall study nothing more than to make them as happy as myself. 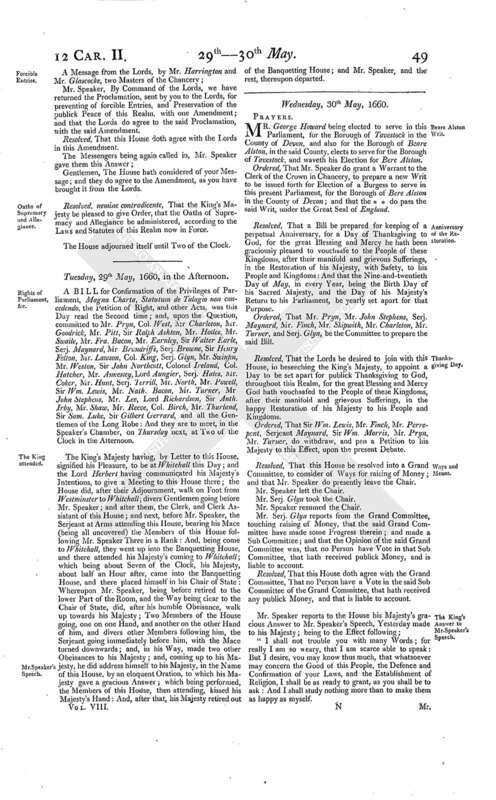 Mr. Finch reports from the Committee, the Draught of a Petition, to be presented to the King's Majesty by both Houses of Parliament, for a Day of publick Thanksgiving; which he read in his Place; and the same was after read by the Clerk. Resolved, That this Petition be approved of, to be presented to his Majesty; and that the Lords Concurrence be desired herein; and that Mr. Finch do carry it to the Lords, for their Concurrence. Resolved, That the Ordinance for Three Months Assessments be forthwith printed; but not to be published, till the House shall give special Order therein. Ordered, That Sir Wm. Doyly, Col. King, Mr. Rant, Mr. Charleton, Sir Ralph Ashton, Sir Walter Earle, Sir John Northcott, Mr. Fra. Bacon, Mr. Baynton, Sir Rich. Temple, Mr. Hatcher, Sir George Savell, Col. Morley, Mr. Trott, Mr. Serj. Glyn, Mr. Milborne. Mr. Calmady, Mr. Fra. Gerrard, Mr. Pryn, Mr. Sandys, Serj. Maynard, Col. Birch, Mr. Gott, Sir William Wheeler, Mr. Turner, Mr. Knightly, Mr. Wingfield, Alderman Robinson, Alderman Frederick, Mr. Arthington, Mr. Pedley, Mr. Hunt, Col. Bowyer, Mr. Shapcott, Mr. Hele, or any Five of them (being a Sub Committee, appointed by the Grand Committee of this House to bring in Proportions, in Reference to what was formerly done upon the Poll Bill, and upon the Debate of the said Grand Committee) be a Committee of this House for the Ends aforesaid: And they are to meet this Afternoon in the Speaker's Chamber; and make Report thereof To-morrow Morning. Col. King brings Answer from the Lords, that, as to the Proclamation against Papists, which, by Command of the House, he had carried this Day to the Lords, the Lords will return Answer by Messengers of their own. Mr. Speaker, The Lords have commanded us to signify unto you, that their Lordships have appointed to sit this Afternoon, and desire, that this House will also sit, for expediting the Act for Continuance of Process, and judicial Proceedings, which their Lordships have now under Debate. Gentlemen, The House hath considered of your Message; and they will sit at Three of the Clock this Afternoon. The House adjourned until Three of the Clock. Mr. Speaker, The Lords have returned the Act for Continuance of Process, and judicial Proceedings, together with some Alterations and Amendments; wherein they desire your Concurrence. Gentlemen, The House hath considered of your Message; and they will return an Answer by Messengers of their own, presently. The said Alterations and Amendments, sent down by the Lords, were read; and were as followeth; viz. Line First, after the Words "One thousand Six hundred and Sixty," and before the Word "called," leave out the Word "commonly," and put in the Words, "of late." Line Twenty-third, after the Word "Term," and before the Word "called," leave out the Word "commonly," and put in the Words "of late." Line Twenty-eighth, after the Word "Return," and before the Word "called," leave out the Word "commonly," and put in the Words "of late." Line Thirty-fourth, after the Word "Return," and before the Word "called," leave out the Word "commonly," and put in the Words "of late." Line Sixty-first, after the Word "one," and before the Word "Act," leave out the Words "Act or reputed," and put in the Word "pretended." Line Sixty-sixth, after the Word "one," and before the Word "Act," leave out the Words "Act or reputed," and put in the Word "pretended." Line Seventy-seventh, after the Word "said," leave out the Word "reputed," and put in the Word "pretended." Line Eighty-fifth, after the Word "said," and before the Word "Act," leave out the Word "reputed," and put in the Word "pretended." Line Eighty-seventh, after the Word "discontinued," leave out all the Words before the Word "provided," in the Ninety-fourth Line. Line Eighth, of the Proviso annexed, after the Word "recited," and before the Word "Act," leave out the Words "Act or reputed," and put in the Word "pretended." Resolved, That this House doth agree with the Lords, that the Words "of late," be inserted in the several Places, instead of the Word "commonly." 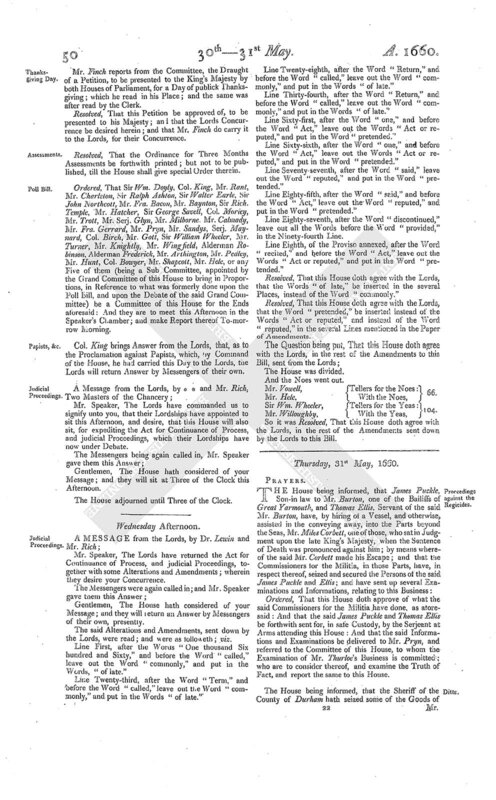 Resolved, That this House doth agree with the Lords, that the Word "pretended," be inserted instead of the Words "Act or reputed," and instead of the Word "reputed," in the several Lines mentioned in the Paper of Amendments. And the Noes went out. Mr. Vowell, Tellers for the Noes: 66. Sir Wm. Wheeler, Tellers for the Yeas: 104. So it was Resolved, That this House doth agree with the Lords, in the rest of the Amendments sent down by the Lords to this Bill.